Designed as a military and law enforcement duty side arm, the CZ 75 SP-01 means serious business when it comes to defensive and tactical weaponry. The full sized hand gun is surprisingly quite popular for its accuracy and handling, and it’s even used for competitions. If you get your own hands on this weapon, you’ll need a dependable holster too. We’ve put together a review of the best CZ 75 SP-01 holsters on the market, and we’ll tell you which is our favorite at the end. We chose a mix of inside and outside the waistband holsters for this review. While this gun probably isn’t the most ideal for concealed carry, you still want a holster that you can throw a shirt or jacket over in most cases. A larger weapon means you’ll need to focus on coverage and weight distribution on the hip, so we’ve picked some prime holsters that will fill those needs for you. 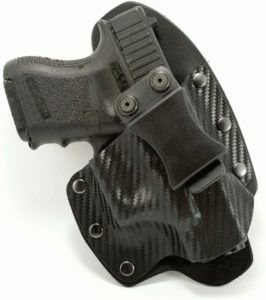 Materials – If you’ve read any of our holster reviews before, you’ve likely seen this one pop up here and there. 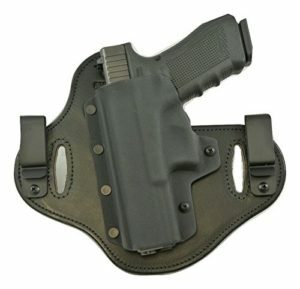 This hybrid holster is worn inside the waistband, and it’s made of kydex and leather. The carbon fiber black kydex is very thin, and it’s molded to the shape of your weapon. Both the rear and muzzle of the holster are left open. A black leather back panel acts as a sweat guard, and it protects your CZ 75 SP-01 from damage as well as protects your skin during wear. 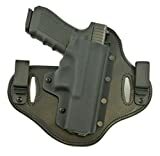 The holster and panel are bolted together with six screws for a high retention. The single belt clip is held in place by two retention screws, and you can adjust it for cant. Performance – When it comes to a full sized handgun, like the CZ 75 SP-01, choosing a holster with a back panel is a wise choice. Especially when it comes to your inside the waistband holsters, you want some type of material that is going to protect your hip from a large grip. The leather panel from Outlaw isn’t the highest quality leather, but it’s soft and comfortable to wear. A hard kydex holster will keep your handgun well protected behind your waistband. While there are retention screws on the belt clip, there aren’t any on the kydex holster itself. 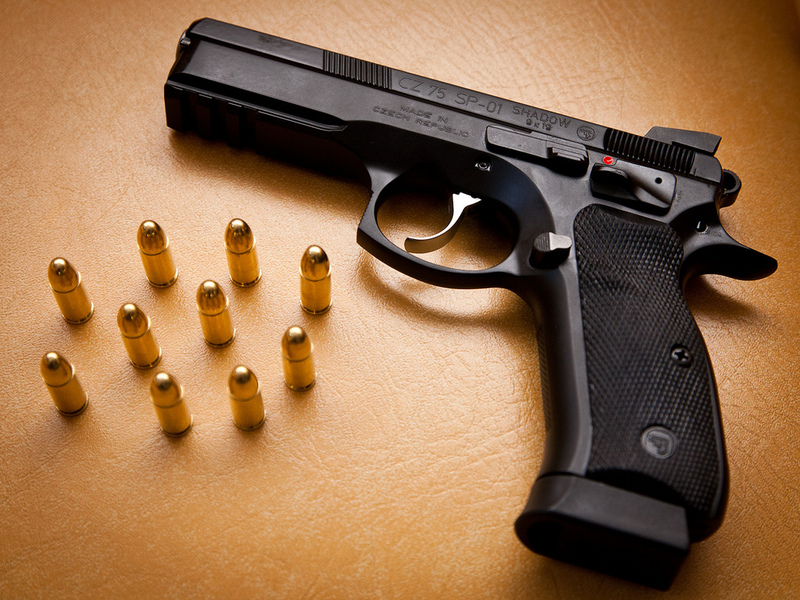 For a larger handgun like this one, some extra screws would really seal the deal. Either, this is a great choice for IWB concealment. What we say – The Outlaw Holsters Hybrid IWB Holster is a great choice for anyone with a small budget. This is also the best CZ 75 SP-01 holster for those who prefer kydex, but want to steer away from the more commonly seen OWB kydex holster without a panel. Materials – Moving on to an outside the waistband holster, this pancake design for your CZ 75 SP-01 is made entirely of double shoulder cow hide in all tan. There is double stitching for reinforcement across both lengths of your weapon, as well as around the edges of the belt loops. The holster is not molded, but the retention relies on how tightly you fasten it to your waist, as well as the wide thumb break. Choose from a straight draw or a forward angled cant. You can wear your handgun high and tight against the waist, or you can let it sit a little low for comfort. 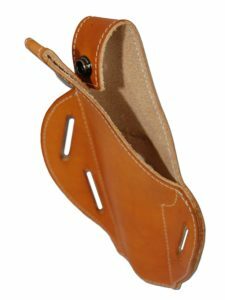 The inside of this holster is soft to promote a smooth draw as well as to protect the gun from being scratched or scuffed by the leather. Performance – One of the best ways to get full coverage of a larger handgun is to go with a pancake holster. Barsony’s outside the waistband holster for your CZ 75 SP-01 gives us the best of both worlds. The design allows you to wear your weapon as high and tight as you need to on your belt for a secure fit. 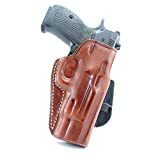 However, the holster isn’t molded, so there’s no fussing with unnecessary amounts of retention, and you can have a quick and smooth draw every time. There’s plenty of room in the holster to protect the gun’s rail without allowing too much space for movement, however it definitely won’t fit a light attachment or laser. This holster isn’t particularly discrete, and most passersby are likely to see it. What we say – This is the best CZ 75 SP-01 holster for those who aren’t very concerned with concealed carry and like the idea of a pancake holsters adjustability. Premium leather pancake holster with precision stitching, lightweight (only 4 oz) and is made in the USA. Holster accepts belts up to 1 3/4" (1.75") width. Made from U.S. double shoulder 7 oz. weight cowhide. Materials – Another leather holster for your CZ 75 SP-01 is this paddle design. The holster is hand molded from premium grade leather in a dark brown color. It’s an outside the waistband option, and it also features an open top and bottom for an easy draw and even easier holstering. Inside is rail space available for your weapon’s sights, so neither the gun or the leather gets scratched or damaged. There is stitching at the trigger guard for additional retention. The belt paddle is attached by two retention screws, which can be adjusted for a straight cant or a forward cant. The paddle also has a special texture surface for extra gripping power against your belt. 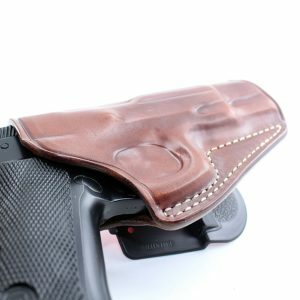 Performance – If you like the look and feel of leather, but you want some concealment still, then this is the best outside the waistband holster for you. Although it’s lacking any sort of pack panel or thumb break, just keeping a comfy t-shirt between your waist and your handgun should avoid any discomfort. The highly molded holster keeps your CZ 75 in as confined of a space as possible while still allowing for an easy draw. By adjusting the retention on the paddle, you can fine tune how smooth you want that draw to be. Plus, picking from your preferred cant gives you all the more ease. Since we’re talking about a full sized hand gun, the paddle may or may not be everyone’s favorite. You’ll have to play around with those screws to make sure the paddle holds the weight of your weapon properly on your belt. What we say – This is the best CZ 75 SP-01 outside the waistband holster for those who want to be able to conceal their weapon under a shirt or coat. It’s discrete and about as low profile as you can get with a leather holster. TUGCE Made from Premium Leather. Hand-made molding for perfect fit. Open top for fast drawing. High concealment. Sight rail space to protect the leather and muzzle sight. Has a moving polymer paddle to adjust the carrying angle. Using 2 screws on the polymer paddle the holster can be easily switc between horizontal and vertical stances. Fits up to 4.5cm belts. Adjustable tension screw for customized retention. Sight rail space to protect the leather and muzzle sight. Has a moving polymer paddle to adjust the carrying angle. Using 2 screws on the polymer paddle the holster can be easily switc between horizontal and vertical stances. Materials – Finally, our last hybrid option is this kydex and leather combo, feature a wide back panel to thoroughly distribute the weight of your CZ 75 SP-01 handgun. The kydex holster is gently molded, and it covers nearly the entire surface area of the weapon. It’s bolted into place with four bolts along the rail, and there are two retention screws at the trigger guard. The leather back panel is available in either black or brown, and it features suede lining for additional comfort. Slide your belt through the two loops provided and under the pair of belt clips. The belt clips also have retention screws. Performance – One of the best ways to make sure the weight of your CZ 75 SP-01 is under control is by using a hybrid holster such as this one from Hidden Hybrid. While our first option in this review also had a leather back panel, the panel on this one goes beyond the width of your gun, and it properly distributes friction. This is especially ideal for anyone with a larger waist, which (let’s admit it) is most of us! Although it’s still an outside the waistband option, this is also one of the best choices for true concealment. However, if you like, you could utilize only the clips and wear it as an inside the waistband option as well. What we say – This is the best CZ 75 SP-01 holster for those who need maximum comfort and the most concealment possible with their full sized weapon. The only downside is that this is the most expensive option within this review. If you couldn’t gather from how we were describing it, our absolute favorite holster out of this review was the Hidden Hybrid Holsters Concealed Carry option. Despite being the most expensive option, it’s actually quite affordable. You get the combo of comfortable leather, suede, and durable kydex performing the function that each material is best at. Plus, this was easily the best option for distributing the weight and friction for a handgun of this size. You can trust your CZ 75 won’t budge for a second while you wear this baby. It’s definitely worth checking out.